A few years back, the Powerball jackpot reached $1.5 billion, and a lottery frenzy ensued. That's when financial website Business Insider decided to run an experiment. A reporter stood by a lottery stand and offered to buy people's freshly purchased tickets for up to double their face value. Most folks clung to their tickets as if they had already won. This makes no sense. We all know that those tickets would likely be worthless after the lottery drawing. Even before the drawing, when those tickets have some (infinitesimal) chance of paying off... if someone offers you double the price, you should take it. The point is – folks make weird decisions. Our animal brains can fool us. This example is a little frivolous, but we often make real, costly mistakes worth hundreds of thousands of dollars when investing or planning our retirement strategies. Humans are prone to an emotional bias called the "endowment effect." This phenomenon, also known as "divestiture aversion," occurs when we place a higher value on something simply because we own it. Richard Thaler, a pioneer in behavioral economics who won a Nobel Prize for his work, loved to show this concept with coffee mugs. He'd offer to sell folks a generic coffee mug with a university logo on it, and the median price people were willing to pay was somewhere around $2.50. However, if he gave the mugs out for free and then tried to buy them back from people, the median price they would demand was about $5.25. Once it becomes "your" mug, it becomes a lot more valuable to you. We demand unreasonably high prices to give away the things we own. Think of it this way... Let's say you own shares of retail chain JC Penney (JCP) because you used to work there and received shares as a part of your annual bonus. But your current portfolio consists of a mix of stocks that either pay a high dividend or have substantial growth potential. JC Penney fits neither of those requirements. It hasn't paid a dividend in seven years, and its revenues are down 32% since 2011. Plus, it's accumulated a mountain of debt. But there are folks out there holding too much JC Penney stock because they value it more than a reasonable buyer would. They've created a strange link between their identities and that stock. One explanation for why humans do this is that the endowment effect increases our bargaining power when trading in small groups, giving us an evolutionary advantage. Therefore, we've all descended from ancestors with an endowment effect built into their brains. Whatever the reason, it doesn't help us today. We've all got a drawer full of junk that's worth $2.50 at most – just like that coffee mug. Let's purge the mugs from our portfolios. A simple test can help you change your perspective and shake off the endowment effect: From our example above, let's say you own $5,000 of JCP stock. What if, overnight, that $5,000 in stock turned into $5,000 cash? You now have the choice to either repurchase shares of JCP for the exact same price, or use that $5,000 to invest in another stock. Almost everyone would choose to invest that $5,000 elsewhere. Let's face it – the S&P 500 includes probably 400 stocks you'd rather own than JC Penney. Nothing happened to JC Penney overnight... The only thing that changed is your possessions. Mentally clear out your portfolio. Imagine selling everything and going to cash. Then review every investment as if you were deciding to buy it again. That's the way the market works, really. Everything you hold today, you essentially decide to "buy" anew each and every day. If you want to set your portfolio up for success, you'll do better to act that way. Editor's note: Controlling your emotions is the key to Doc's latest investment idea. Investors hate this company. But what they don't see is it could be poised for a major turnaround... with the potential for quick 30%-40% gains. To learn how to access this recommendation with a risk-free trial of Retirement Millionaire, click here. "It's a nearly universal impulse... but it's a terrible investing choice," Doc says. There's an easy way to avoid this common pitfall when selling your stocks... Learn more right here. "The phrase 'just because you can doesn't mean you should' applies to almost everything in your life," Doc writes. "Too many investors are making this mistake today." Get more details on how to protect your portfolio right here: How to Quickly and Easily Lose More Than 100% of Your Money. Church & Dwight (CHD) is the $18 billion company behind a wide range of well-known household brands, including Arm & Hammer cleaning products, Vitafusion vitamins, Pepsodent toothpaste, and OxiClean detergent. Folks buy these goods again and again. 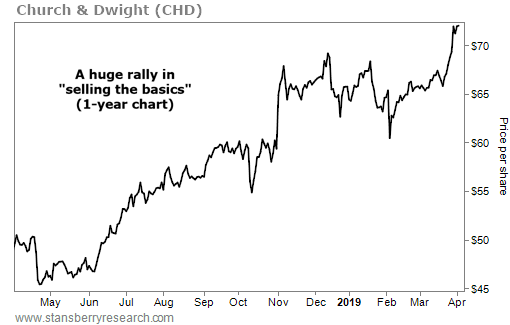 And believe it or not, Church & Dwight’s “basic” products added up to more than $4 billion in sales last year… a 10% jump from 2017.